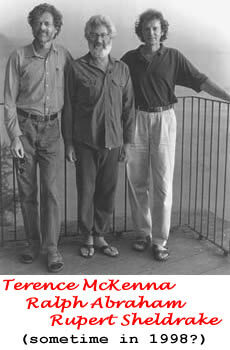 This podcast is part of a dialogue between Terence McKenna and Ralph Abraham that took place at the Omega Institute on August 1, 1998. It isn’t often that we have the opportunity to see how accurate predictions about the future are, but this fascinating conversation between two of the great thinkers of our times has already proven to be right on target. The reason this may be of interest to you is that if they correctly predicted some things that have now happened, then we are really in for some big time excitement if some of their more far-out predictions come true. my site has been hacked extensively, it took me about one month to clean everything, but now it’s 100% clean and running! my Norton a-v software just blocked a ‘mass injection’ attack when i attempted to go to the link under fun-da-mental’s name. Lorenzo, play that again on December 2012, and tell people just to interchange the word ‘millennium’ with ’21 Dec. 2012′, it will still work fine..! Comments for this post that appeared before June 2010 may be found here. Ralph mentions Dean Radin and the fact that his work demonstrates the reality that parapsychology is real and scientific…. to learn more., here’s some info. IONS has a $10/mo membership where they send you books and cd’s and an amazing amount of info about cutting edge research putting the inner and outer worlds together.